Eli got a few kites for this last birthday and he always wants to fly them. We've tried a few times, but the wind wouldn't cooperate. Well today it was great! He was doing it "all by myself!" Who knew a cheap little kite would provide such excitment and entertainment?? My precious little boy is 1 month old! He's getting so big! He's weighing in at 9lbs. 2 oz. He has put on weight a lot faster than Eli did! I can only hope that maybe this means he'll start sleeping through night soon??!! 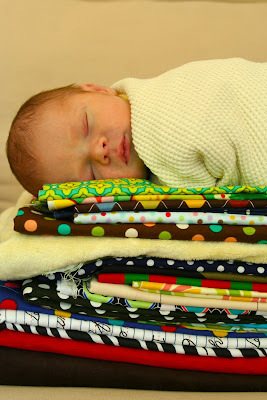 Here is a newborn picture of Cole...compliments of Meg! He looks an awful lot like Eli...but has his own look too! Cole is starting to smile...coo and notice voices. It's so fun...but so sad that I only have 1 more week home with my sweet little boy. I will head back to work...and he will head off to Grandma's. I will miss seeing his sweet little face all day! Our neighbors made cotton candy for a football game and had LOTS left over! So, they decided to distribute it down the street! I think every neighbor was outside last night, so hopefully they got rid of most of it! We had some friends over and they got to enjoy it as well. If you're looking for a place to move, you should really think about moving out here by us! We have the BEST neighbors...they even bring you cotton candy! Here is a video of Eli singing in the car. You'll have to excuse the way Eli looks in the video...he was up early that morning and I think he was about to fall asleep! Still cute though!! Aaron's grandparent's came to visit over Labor Day Weekend. They live in Iowa, so we are glad that they were able to make the trip to see us and meet Cole! So these last few weeks have been a little crazy. Not only do we have a new baby, but we have been sick with colds. Not really in my plans for my time off to spend with Cole! Last week all 3 boys had colds. Poor Cole...he was only 2 weeks old and he had upper respitory and an ear infection. To add to all of that, we went back in to get him checked out and not only was it not getting better, the ear infection had spread to the other ear. 2 weeks old and ear infections in BOTH ears. I'm afraid we are on the same path that his brother went on...tubes. We got back tomorrow to get checked out again. Here is a picture of Cole and his ouchy. Dr. Patron put him on antibiotics, but it wasn't clearing up so we had to have 2 rounds of antibiotic shots. Poor little guy...he did NOT like that! Hopefully he's on the mend. His big brother likes to hold him and make him feel better. Cole LOVES to look at Eli and listen to his voice! I'm sure most of you have one or have heard about them. We got one as a gift for Cole and I LOVE it!! We never swaddled Eli very well and he didn't really like it. Well...Cole loves it, but the blankets always come undone no matter how hard you try! So today we got a swaddle blanket and I tried it out. Almost instantly Cole stopped crying, calmed down and passed out! Thanks Olivia for the blanket!